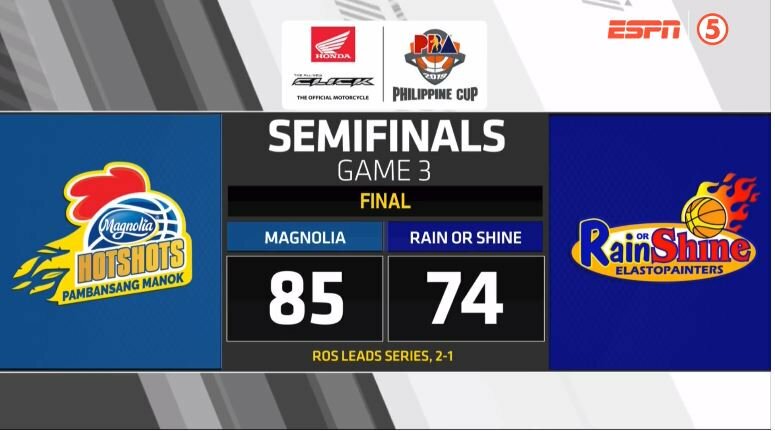 PBA Philippine Cup 2019: Magnolia Hotshots Pambansang Manok defeated Rain or Shine Elasto Painters, 85-74 in Game 3 to cut their series deficit to 2-1 of their best-of-seven semifinals of the 2019 PBA Philippine Cup on Tuesday night at the SMART Araneta Coliseum. MAGNOLIA 85 - Sangalang 16 (11reb), Lee 16 (7reb, 3/6 3pts), Melton 9, Jalalon 8 (10reb), dela Rosa 7, Reavis 7 (11reb), Barroca 6 (10reb, 6ast), Herndon 6, Brondial 5 (7reb), Simon 3, Ramos 2. RAIN OR SHINE 74 - Mocon 18 (9reb), Belga 12 (7reb), Torres 10 (4reb), Daquioag 7, Yap 6 (4reb), Norwood 6 (9reb, 4ast), Nambatac 6 (8reb), Alejandro 3, Borboran 2, Rosales 2, Ponferada 2, Ahanmisi 0.